If you are from Gujrat (west part of India) then people will always ask you about Dhokla recipe. There are different types and versions of making dhoklas, they can be made with gram flour, semolina, mixed grains, lentil and rice and many more combinations. 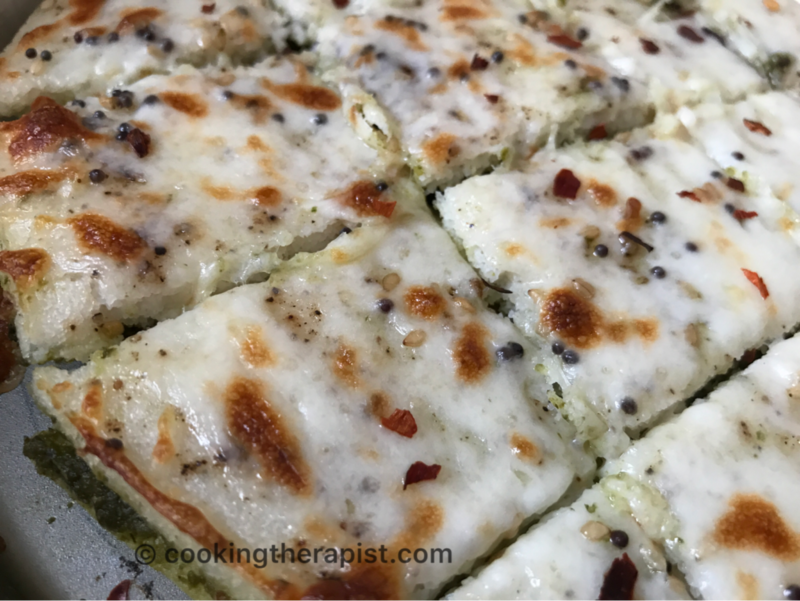 Traditionally sandwich dhoklas are made up of layers of rice and lentil (urad dal) batter (idli batter) and a thick layer of mint and cilantro chutney. As you might know I love to do experiment with flavors so I have made this recipe with my twist of replacing mint and cilantro chutney to basil pesto. 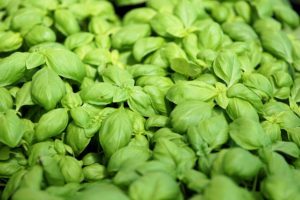 Basil is well known for it’s medicinal property hence it is better to use these green leaves into our diet. My family loves flavor of basil pesto so thought of this combination. Using different ingredients in our day to day food is a great way to get their benefits. I have made it with some shredded mozzarella on top and broiled it in the oven to make it more trendy but adding cheese is completely optional. It taste great too without adding cheese. Skip it if you are vegan or having any allergy to dairy products or nuts (basil pesto contains pinenuts). 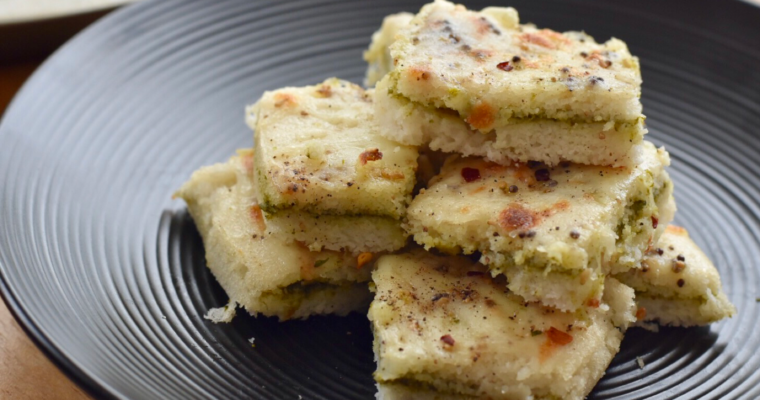 Have this dhokla as a breakfast, snack or dinner and make your meal more palatable. Waiting for your feedback, let me know how it turned out. 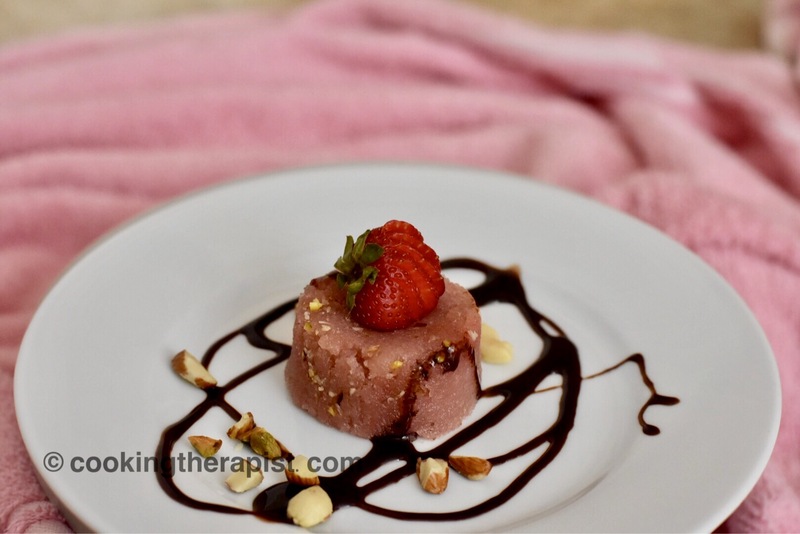 You can try my more healthy snacking recipes. 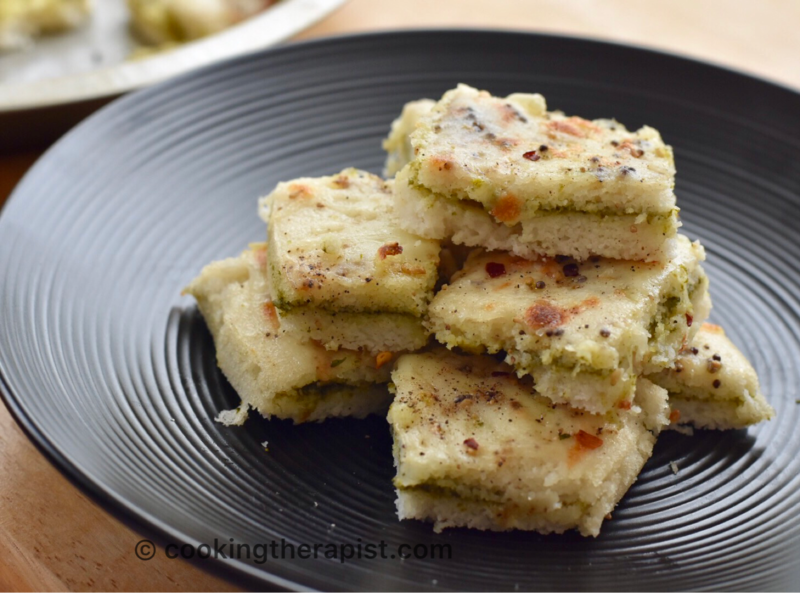 Sandwich dhokla is layer of rice and lentil batter with refreshing basil pesto in between. For making dhokla batter - soak dal, rice and dried fenugreek seeds separately for 8-10 hrs. Once it is soaked fully then drained excess water and grind rice, urad dal and dried fenugreek seeds together to a very fine paste. Remove the batter in a big bowl. Keep it aside and let it ferment for ~ 8-10 hrs. Now add salt, soda, oil and 1 teaspoon of water and whisk it well. Boil some water in a steamer and grease the dhokla plates (round cake pan). When water start to boil pour the ½ inch layer of batter in 2 greased plates. Keep the stand in the steamer, cover with the lid and steam till dhoklas are half done. Take the stand out and remove the dhokla plates and spread basil pesto evenly on both dhoklas. Pour the dhokla batter over this again and rotate the plates so that the batter spreads evenly. Fit the plates into the stand and place the stand in the steamer. Close the lid and steam for eight minutes. Take the stand out and let it cool slightly. You can pour a tempering of oil, green chilies, mustard seeds and sesame seeds . Start the oven on broiler mode for 2 mins. 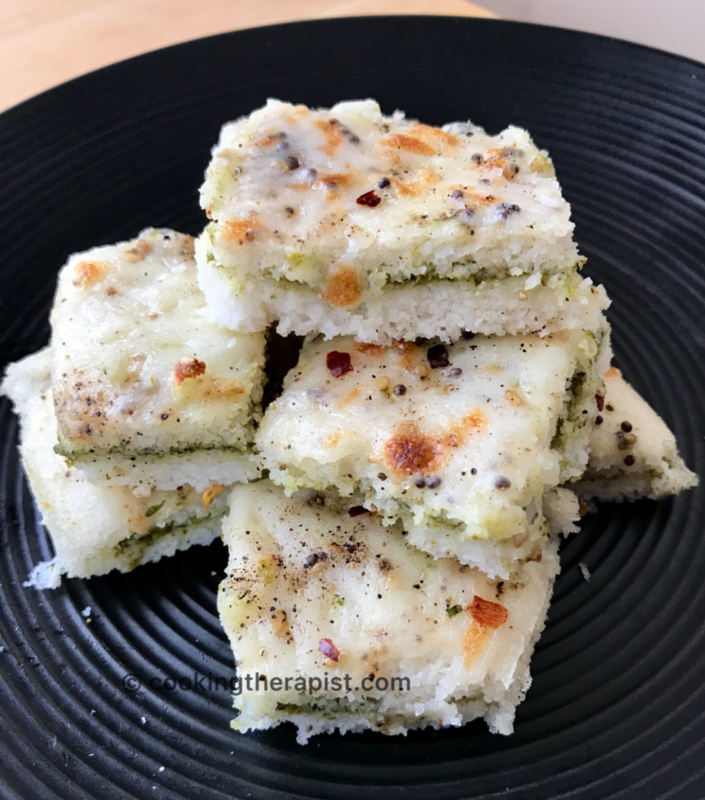 Unmold dhokla plate very carefully with spatula place it in a cake pan and add tempering of mustard seed then add little bit of shredded mozzarella on top of dhokla. Finally cut it into the shapes you like. Serve it hot with basil pesto as a side. Make this dhokla from the idli batter. You can make it in advance and keep it in the fridge or freezer. Use it when you need. Cheese is optional, so after steaming it add tempering and serve it hot with pesto if you don't want to add cheese. Make ahead this dhokla and add cheese and broil it last minutes so that you can serve it hot. If you don't get basil pesto, basil or pine nuts to make pesto replace those ingredients with Tulsi and walnut or you can use mint and cilantro chutney.